This entry was posted on February 14, 2018 by Magnattack. Magnattack Global has developed, trialled, and released an advanced method to reduce rapid wear and damage to magnetic separation equipment. A magnetic separator, without DURA-SLIK™, showing damage after installation in an abrasive product. Rob Baker, Operations Manager of Magnattack Global, says that "whilst Magnattack magnets have performed well in a variety of harsh installations over the years, DURA-SLIK™ is an essential value-add that will extend the longevity of a magnet and help maintain its effectiveness in removing foreign metal contaminants". On the differences that DURA-SLIK™ holds, Baker says "the benefits that DURA-SLIK™ provides against abrasive wear are very clear when you compare two similar magnet installations where one is a Magnattack DURA-SLIK™ design and the other is not". 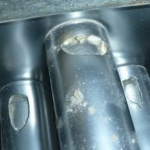 Damage from abrasive wear on a magnetic separation installed in a wheat aspirator application. DURA-SLIK™ technology is available on all Magnattack grate magnets, bar magnets, magnet probes and practically all other magnet or housing surfaces, as an available option on supply where required. It is effective in both dry and wet applications. For further information on this development, please contact a Magnattack Global technician. View the Magnattack range of RE80™ Magnetic Separation Equipment here.